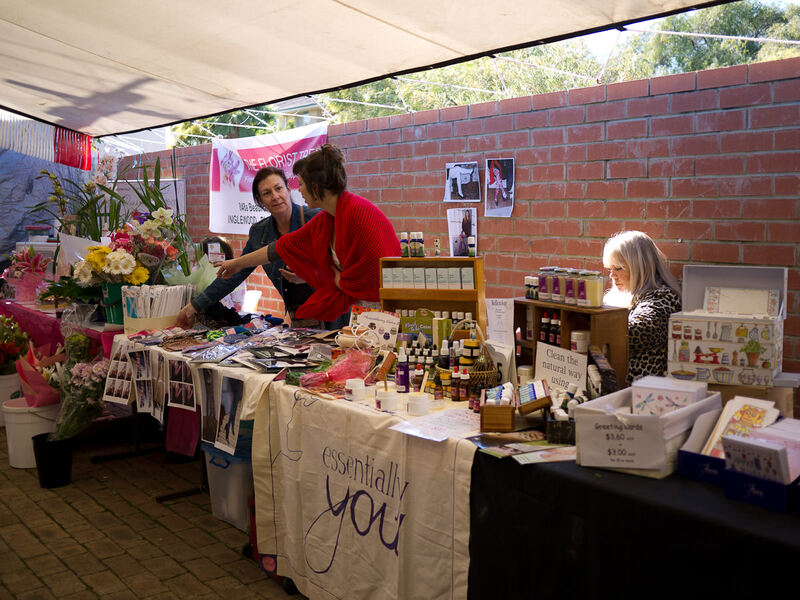 The Mondo Markets are on every Saturday in spring, from 8am to 12.30pm on the corner of Sixth Avenue and Beaufort Street in Inglewood, next to Mondo Butcher. 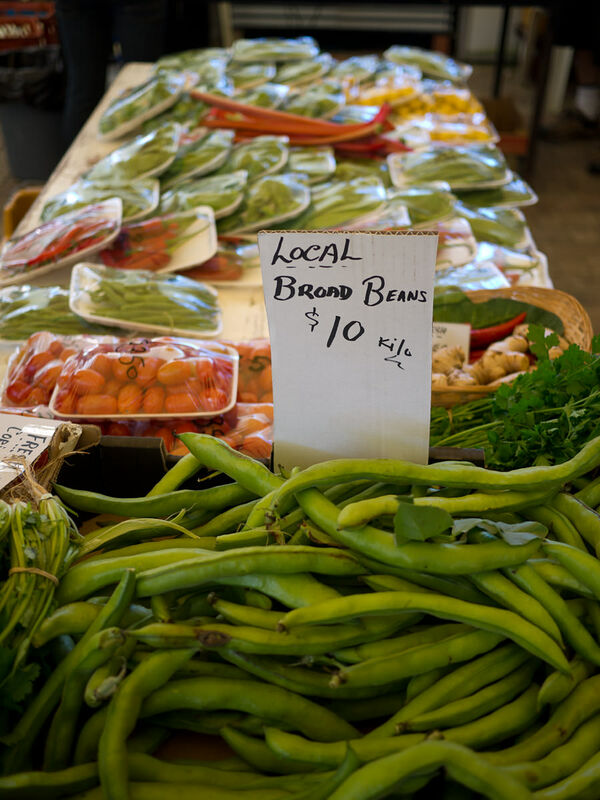 It’s a small undercover market with an intimate, friendly feel. 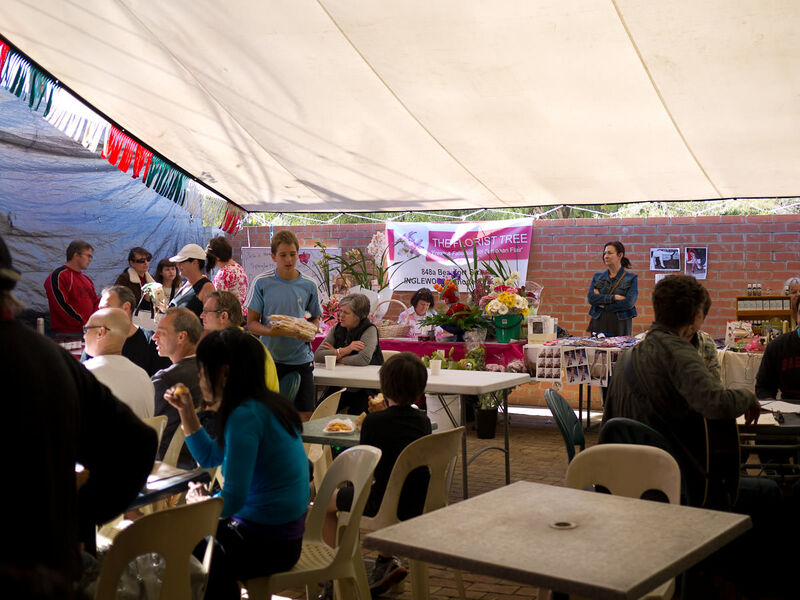 It’s a simple but effective setup – a shaded courtyard with just enough sunshine peeking in, with stalls around the perimeter and tables and chairs in the centre where market-goers can sit and relax, eat and drink. 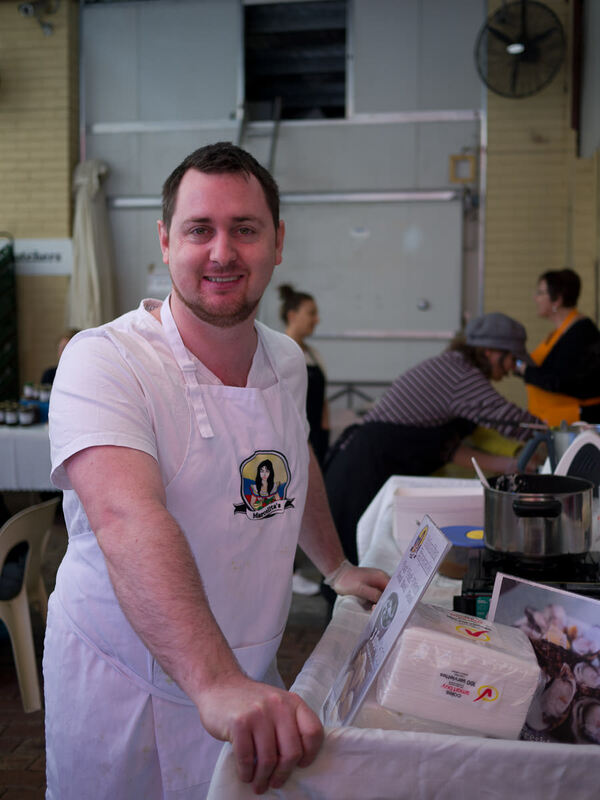 The man behind this community market, local celebrity butcher and Mr Mondo himself Vince Garreffa makes a brief appearance, warmly welcomed by stallholders and punters alike before he returns to his busy shop next door. As I understand, the space, electricity and use of Vince’s cool room are all provided free to the stallholders. Friends meet, greet and embrace each other, and sit and enjoy coffee and breakfast together. 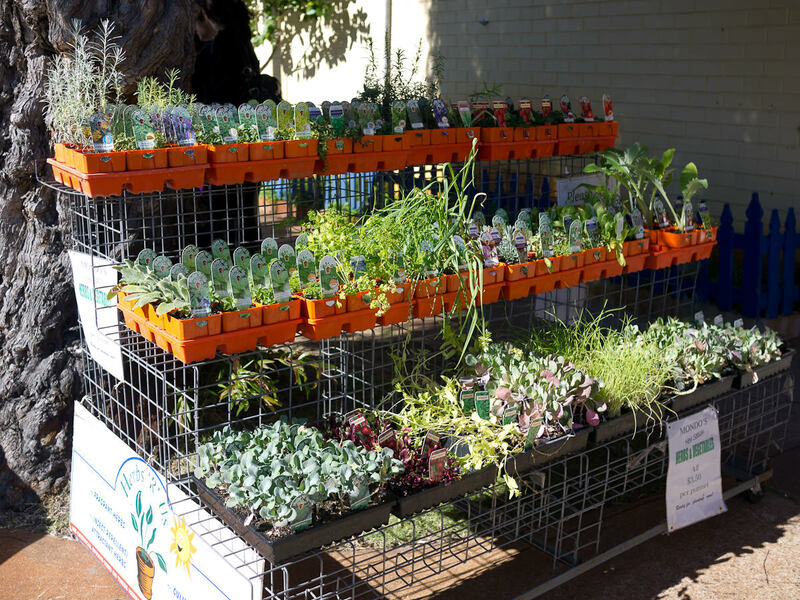 We’d all love a weekend market like this in our neighbourhoods. 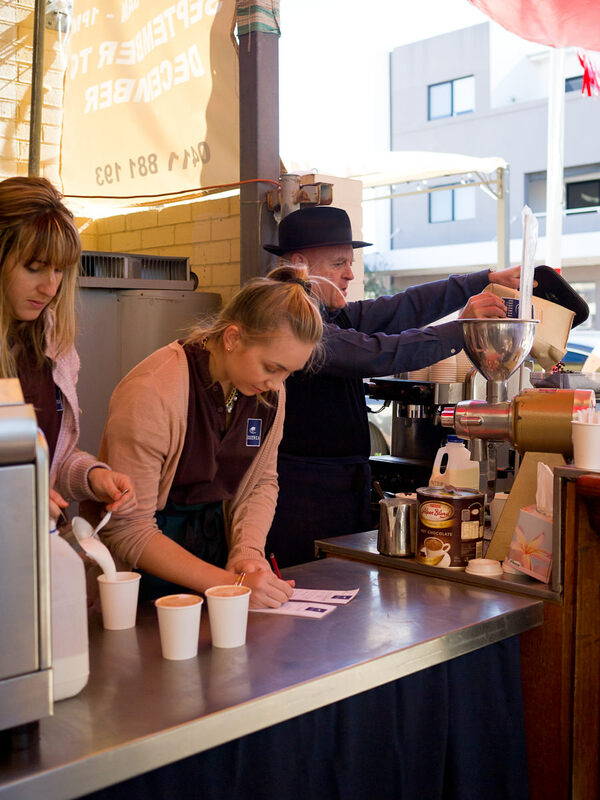 If you need that morning caffeine fix, there is fresh Essenza coffee brewing and hot milk frothing at the market’s entrance. 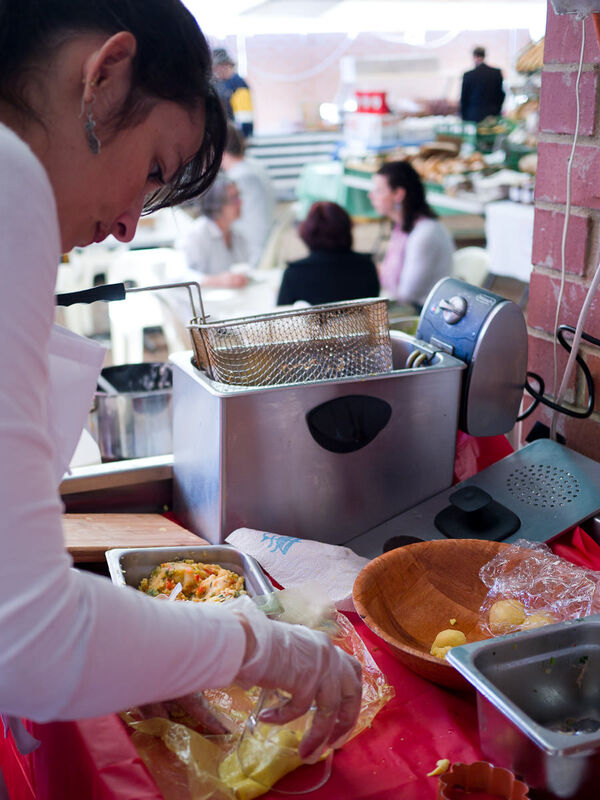 We’re big fans of Marcelita’s Colombian empanadas, having tasted these little beauties at the Perth Twilight Hawker Market in March. 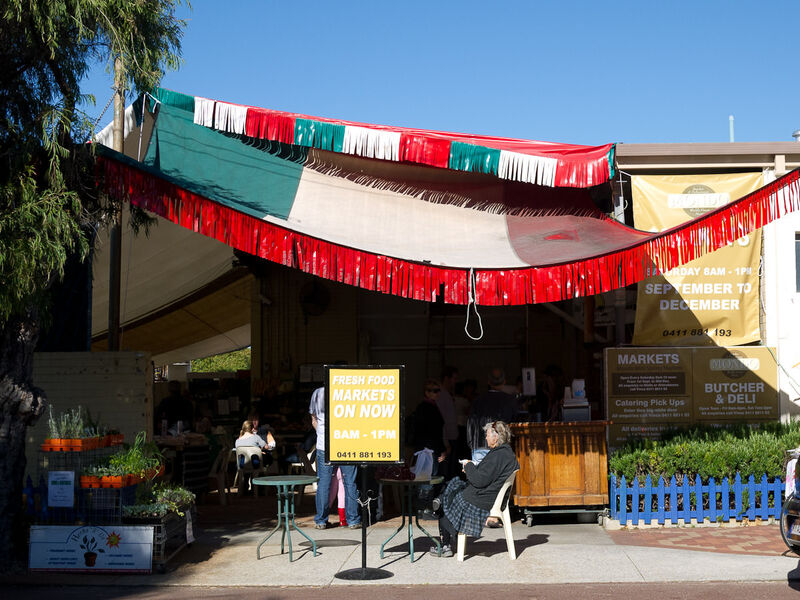 As soon as we arrive at Mondo Market my brain goes into an empanada desire frenzy and I steer Jac towards Marcelita’s stall, where we have a chat and place our order with Matt, Perth’s empanada evangelist and proud hubby of chief empanadista Marcela. 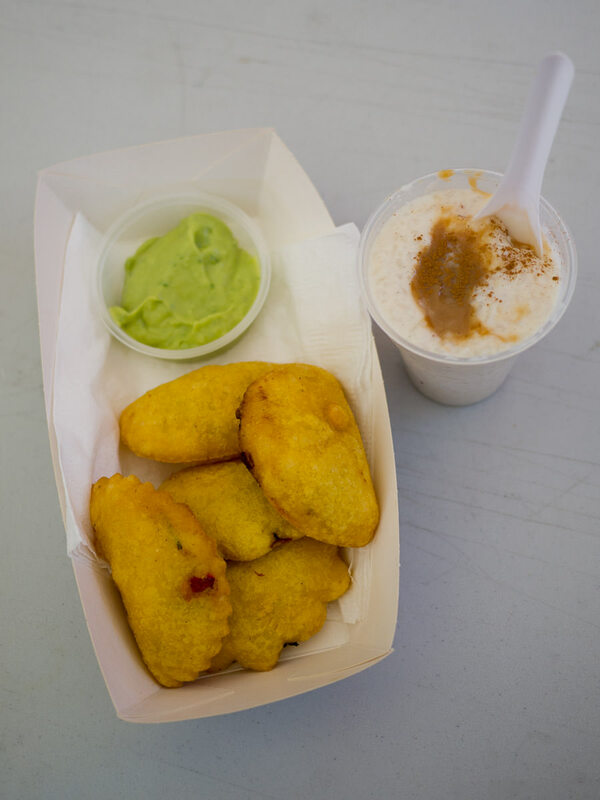 The empanadas are made with masa, or maize flour, which is gluten-free. 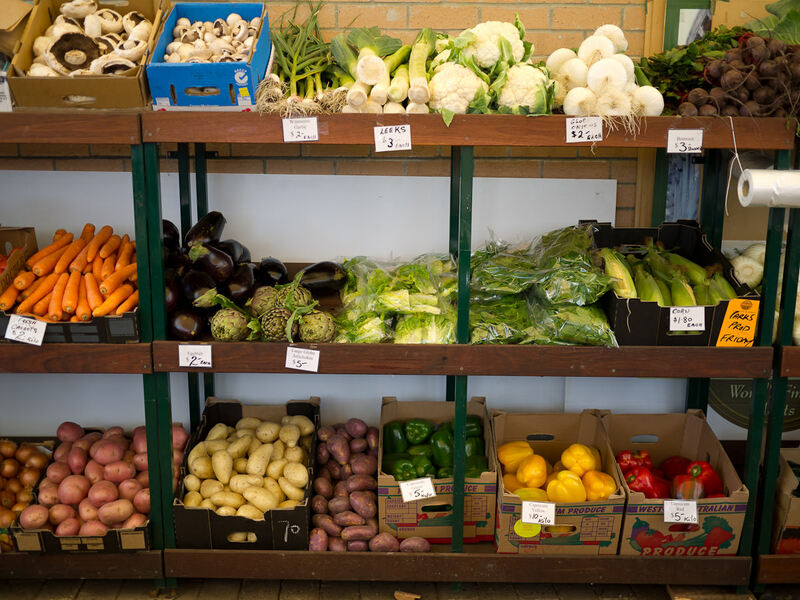 You have a choice of three fillings: pulled pork with lime and coriander, potato with paprika and spring onion, or smoked beef brisket with potato and capsicum. They are AU$3 each or $10 for three plus a sauce. It’s too hard to choose, so we simply order one of each plus one of the day’s special: an oyster empanada for Jac. 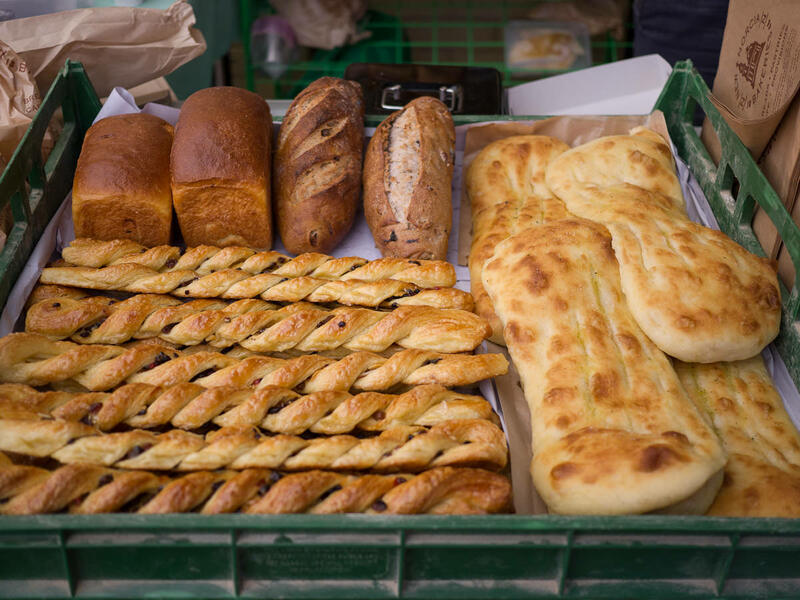 Because maize flour does not contain gluten, it is more delicate and less elastic compared to other flours, which is why the empanadas are made to order, ensuring the dough does not dry out and the delicious corn pastry puffs are always at their best. 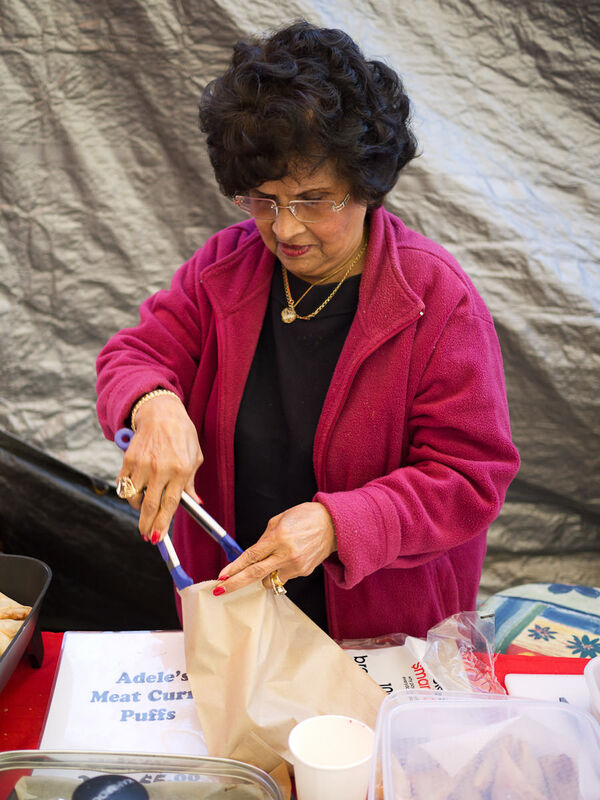 I watch delightedly as Marcela deftly makes Jac’s oyster empanada, placing a plump raw oyster in the centre of potato filling in freshly rolled masa pastry. The oyster cooks to a perfect medium rare inside the pastry when it’s deep-fried. While the empanadistas roll the masa dough, Matt tends to a pot of arroz con leche, traditional Colombian rice pudding. 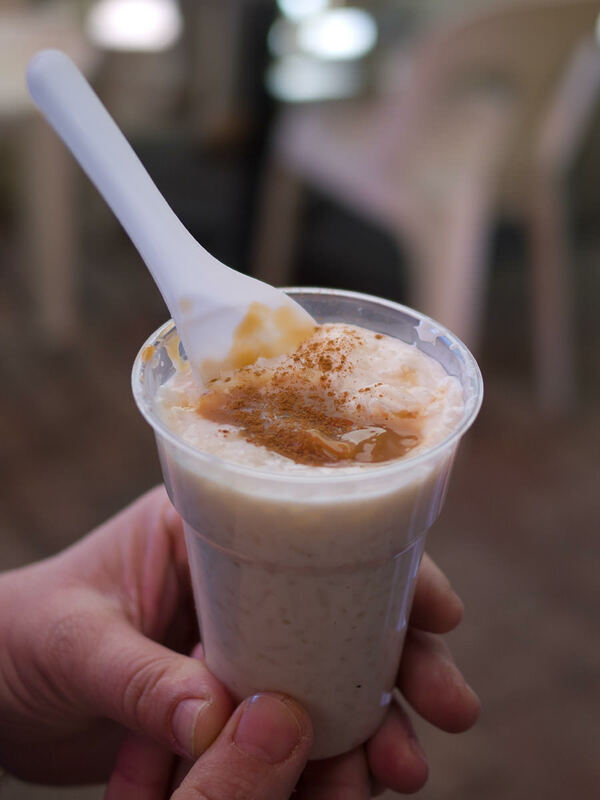 We can’t resist ordering a cup of arroz con leche with arequipe (AU$4), rice pudding topped with gooey slow-cooked caramel. It’s what you want rice pudding to be – hot and comforting. When Matt presents us with our order we are touched and chuffed to find that he’s cooked us an extra empanada. He knows me pretty well – it’s my favourite, pork and lime. Jac’s oyster empanada is distinguished by a 3D “O” for oyster. 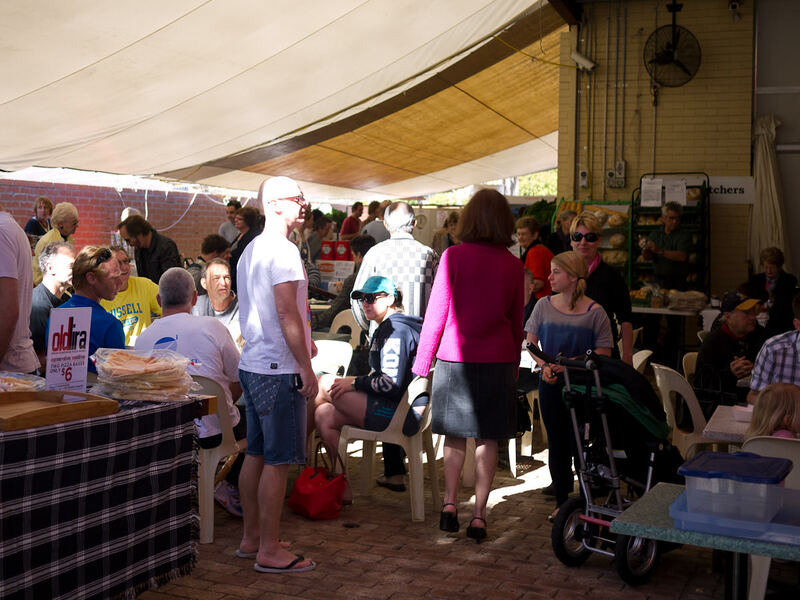 We grab a free table to eat our breakfast, joined by food blogger Apex, who’s also enjoying empanadas and will be doing her fruit and veg shopping right here at the markets after breaky. 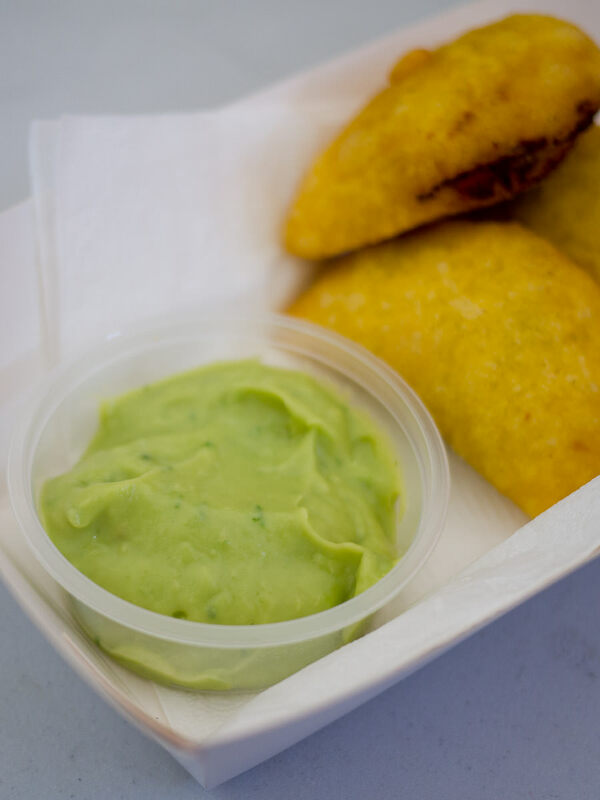 I don’t hesitate to choose guacamole to go with our empanadas. I love Marcelita’s guacamole. It’s smooth, creamy and full of fresh tangy lime. As we eat our empanadas, a bloke at the table next to ours leans over and suggests that we try the spanakopita at The Greek Corner – “It’s sooo buttery,” he says with feeling. We don’t need much more convincing. 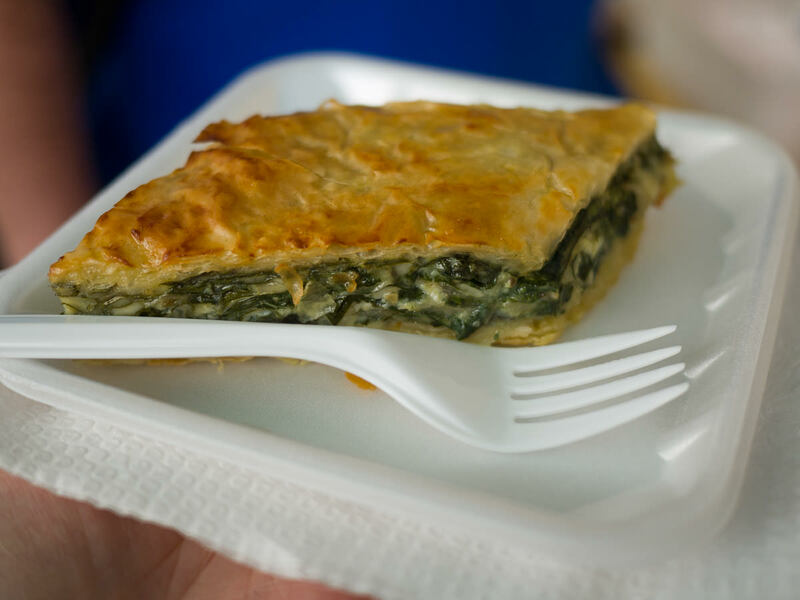 When the empanadas are all gone, we make our way to The Greek Corner and get a slice of spanakopita to share. 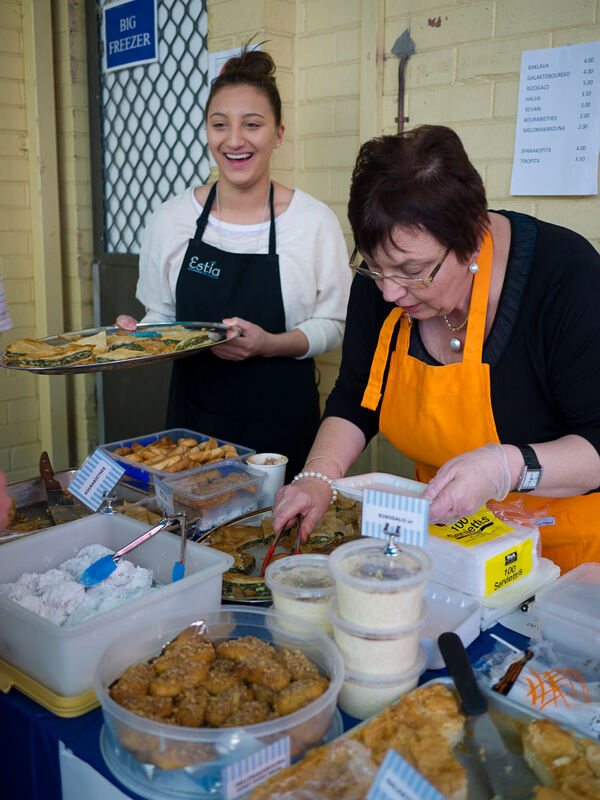 It was lucky we got the recommendation as there are so many goodies on offer at The Greek Corner, I would’ve been bamboozled by indecision. Papa standing off to the side grins at us and says: “Get these girls a big piece!” and we all laugh. The spanakopita is delicious, a crispy buttery pastry sandwich filled with lusciously creamy spinach and feta. Thank you to our mystery food advisor! 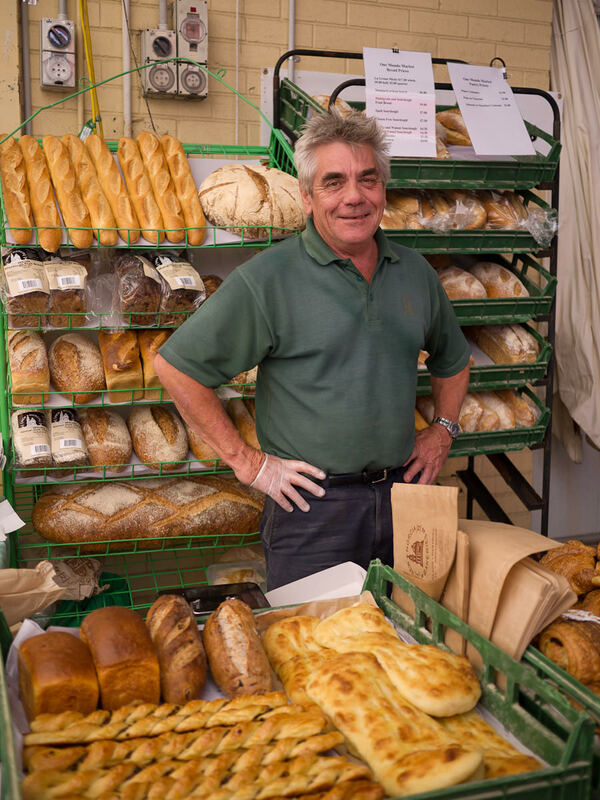 The New Norcia Bakery stall is loaded with crusty fresh loaves of different shapes and sizes, including multigrain and sourdough fruit bread, spelt sourdough, gluten-free sourdough, raisin and walnut sourdough, fig and fennel sourdough and ciabatta. We buy a crusty round sourdough loaf and as I walk around the market taking photographs I’m secretly planning and can’t wait to get home and eat a ham and Swiss cheese sandwich on thick buttered slices of that sourdough bread. 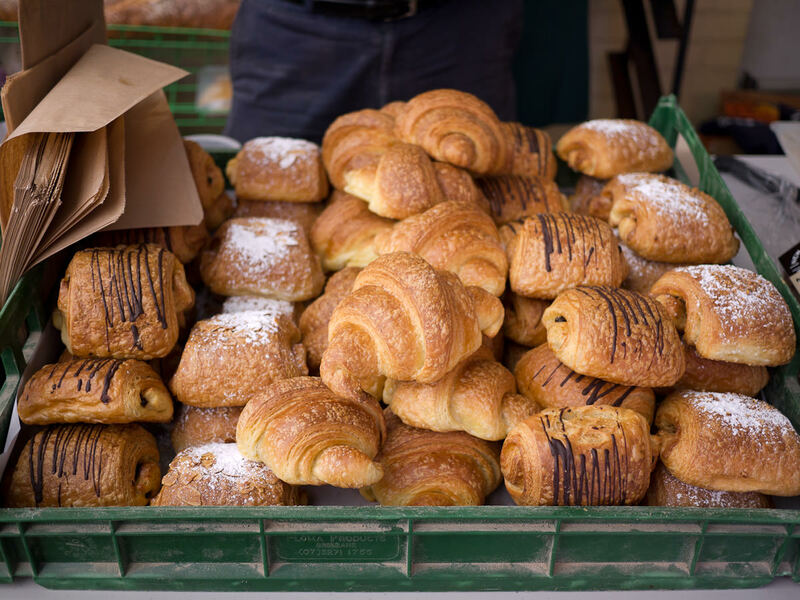 Also for sale, beautiful plain, almond and hazelnut croissants, and pain au chocolat. Perfect companions for coffee! Next, I’m keen to try Adele’s meat curry puffs (two for AU$5). She has vegetable samosas and various spicy relishes and chutneys for sale too. 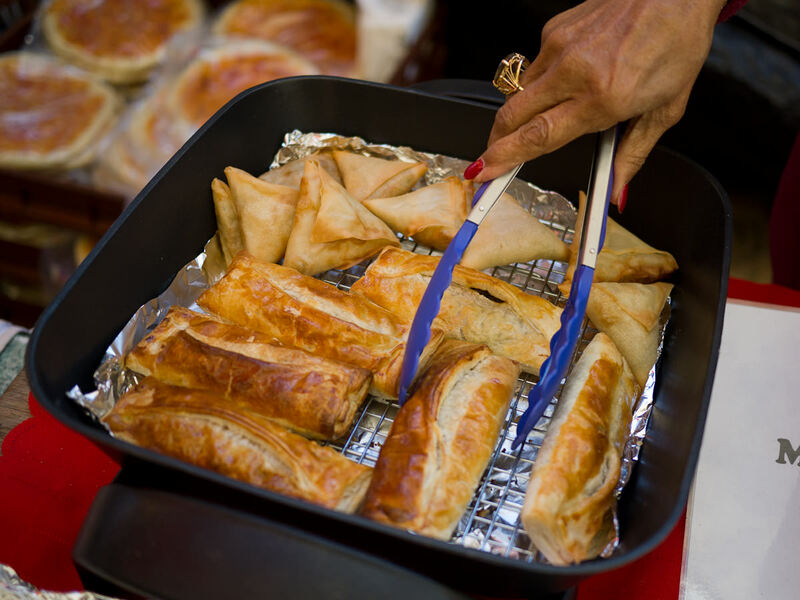 The curry puffs look like sausage rolls and smell very good. Adele is very sweet and smiley and calls us both “darling”! She encourages us to try some relish or chutney with our curry puffs – there’s eggplant relish, lemon relish and chutney. I’m quite content to eat my meat curry puff without a sauce, but Jac, a great lover of sauces, tries them all! They are all tasty and the eggplant relish has a surprising kick. 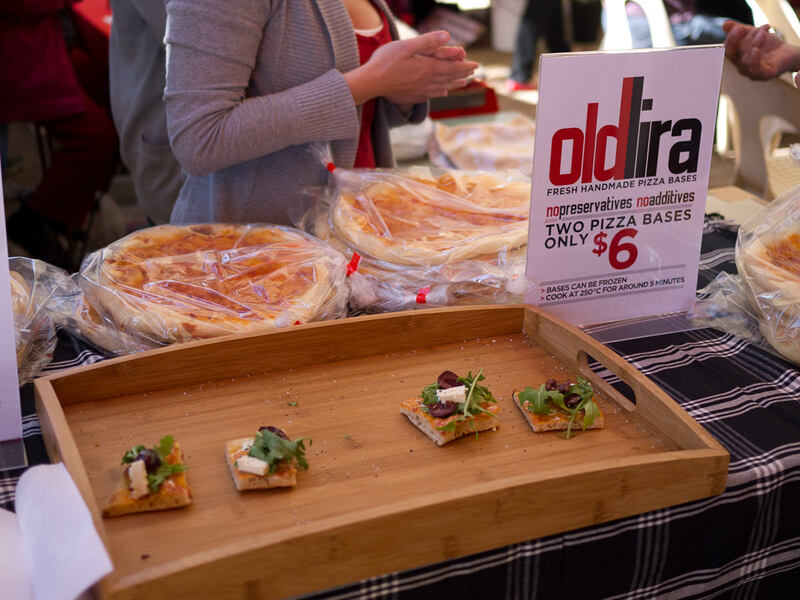 The Old Lira stall has fresh handmade pizza bases for sale, made with no preservatives or additives. 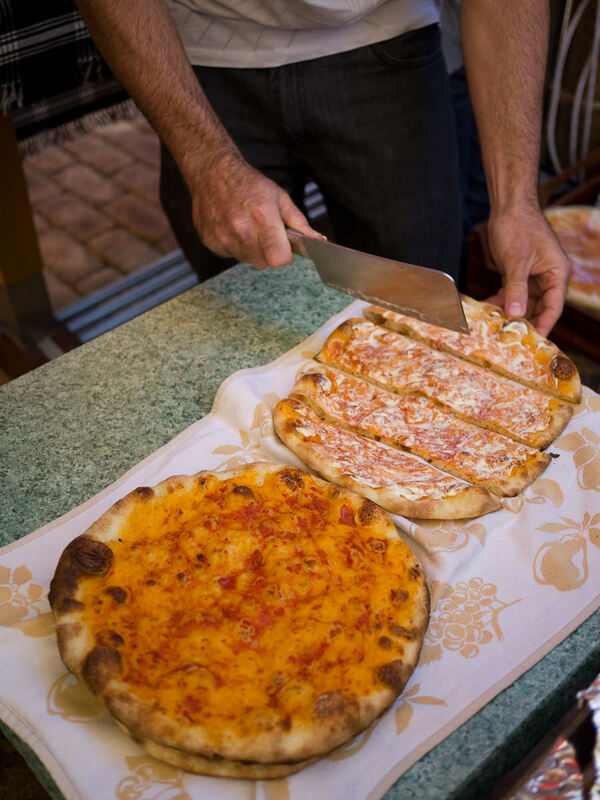 We watch with interest as pizza bases are chopped into pieces with a cleaver. 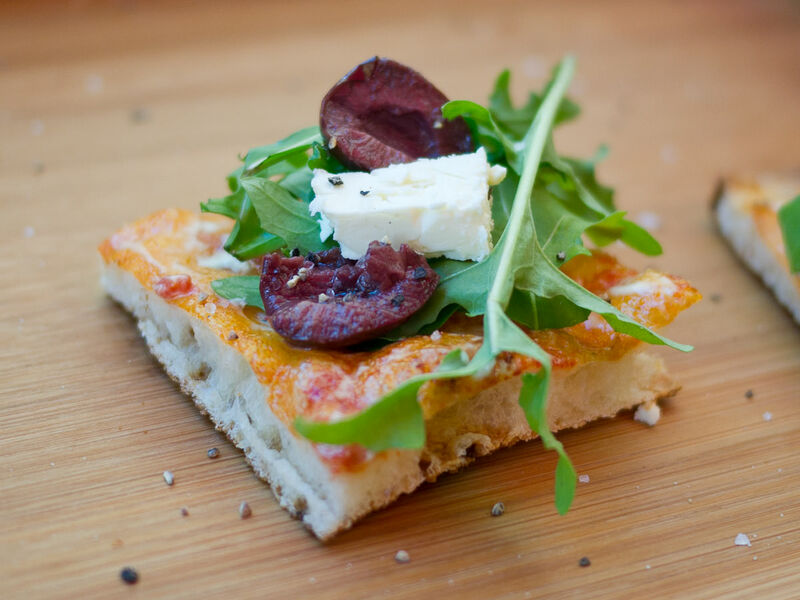 They whip up a tray of pizza squares topped with cheese, olives, fresh rocket and black pepper. These free samples disappear fast! 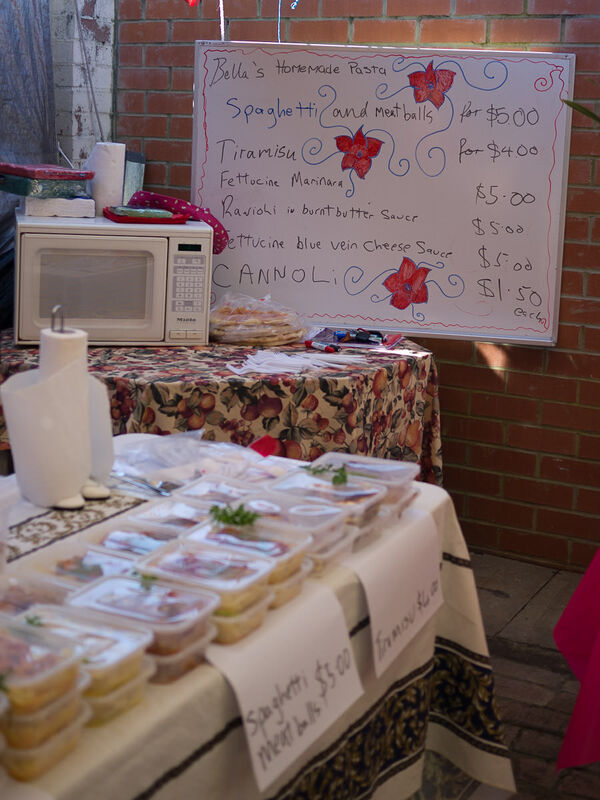 There are homemade pasta meals and Italian sweets for sale at Bella’s Homemade Pasta. 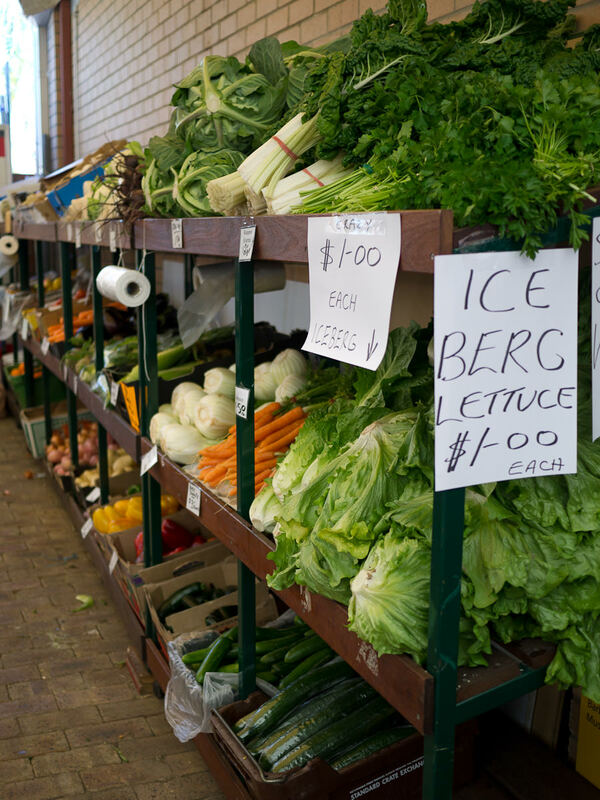 At Mondo Markets, you can buy locally grown fruit and vegetables. 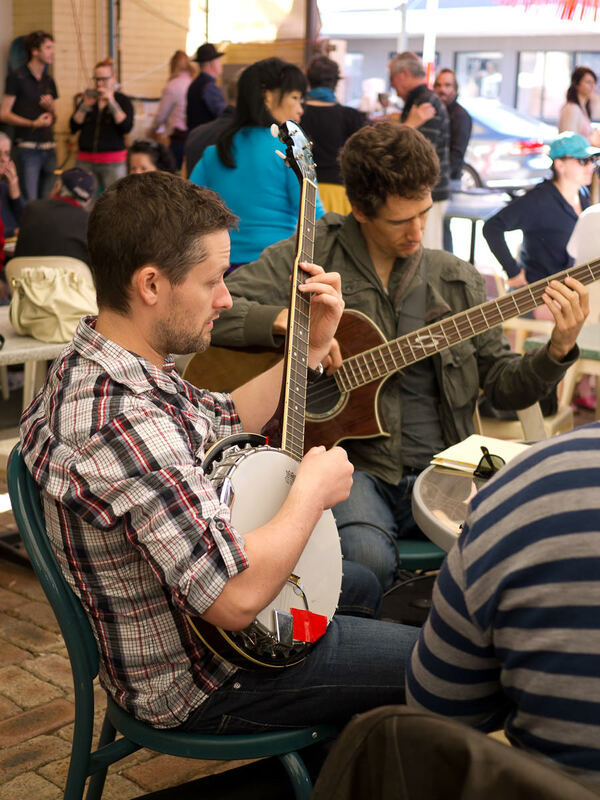 Every week, there is live music at the markets. 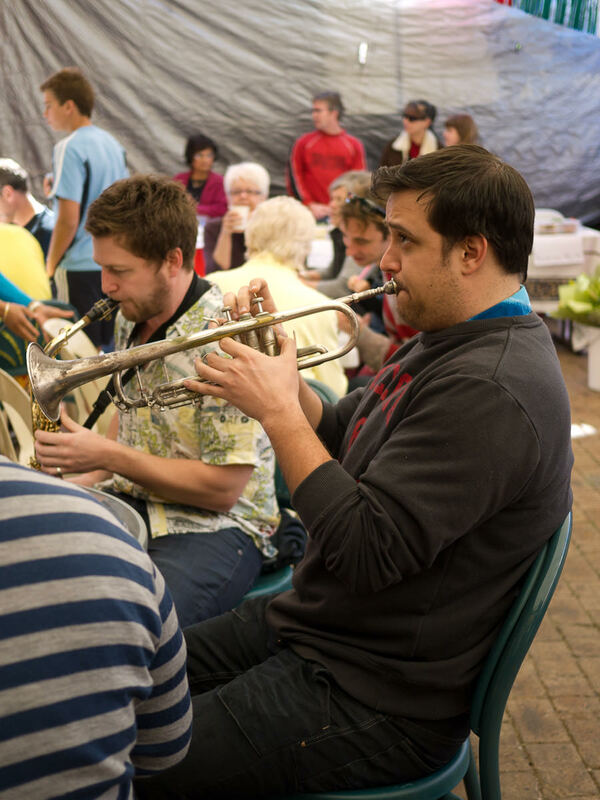 It gives them a great atmosphere and it’s hard not to smile and bop along. 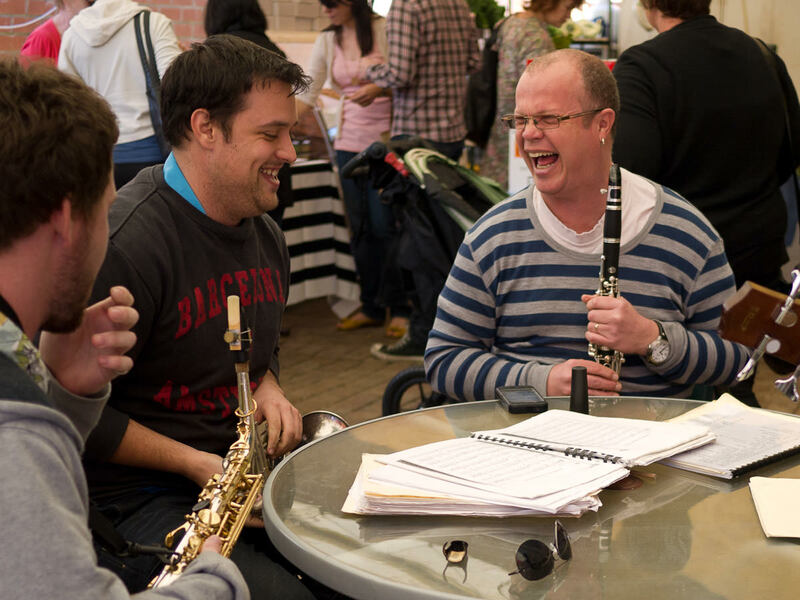 As well as playing, there’s lots of laughing! 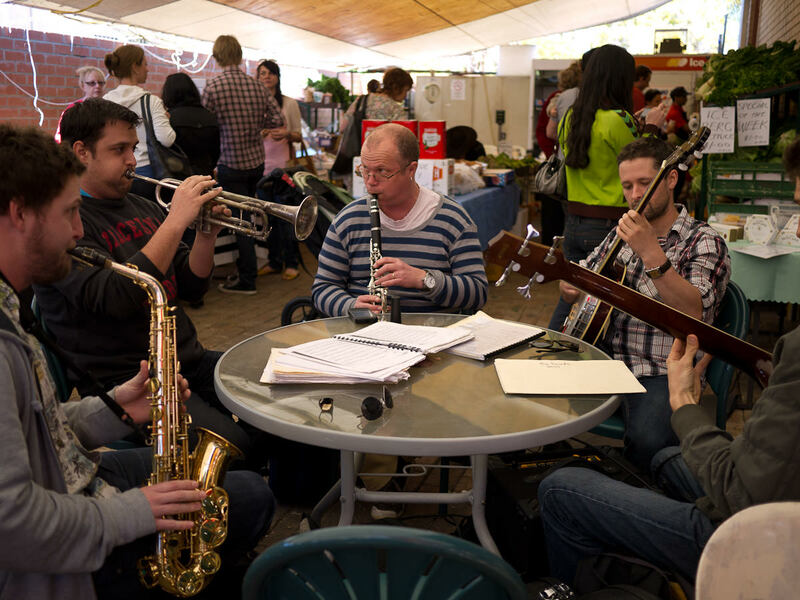 The man with the clarinet is professional muso, Mondo Market regular and music organiser Alex Millier. 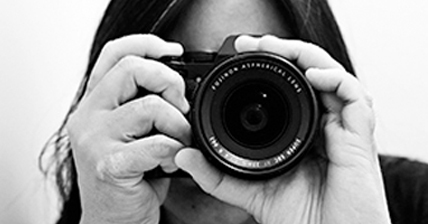 Follow him on Twitter @alexmillier and check his blog Millier’s Musings for Mondo Market info. 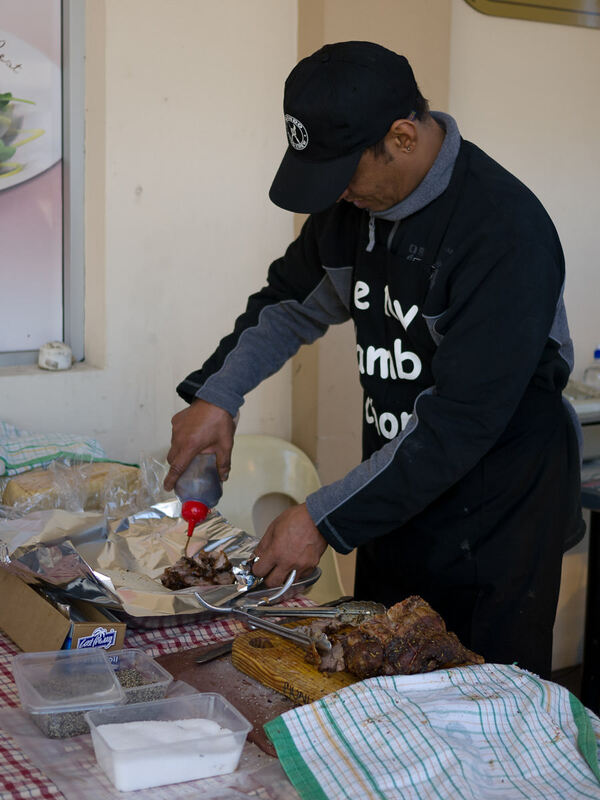 If the food at the Mondo Markets isn’t enough for you, just around the corner, at the front of Mondo Butcher on Beaufort Street, you can get one of their famous hot roast meat sandwiches, available on Saturday mornings all year round. It’s a must-visit destination for carnivores. The meat is carved to order and your sandwich made right in front of you. The slabs of freshly carved roast meat are placed on the bread, a sprinkling of seasoning is added and for the final touch, a good squirt of roast juices. There are cold drinks for sale at the roast meat stall too. 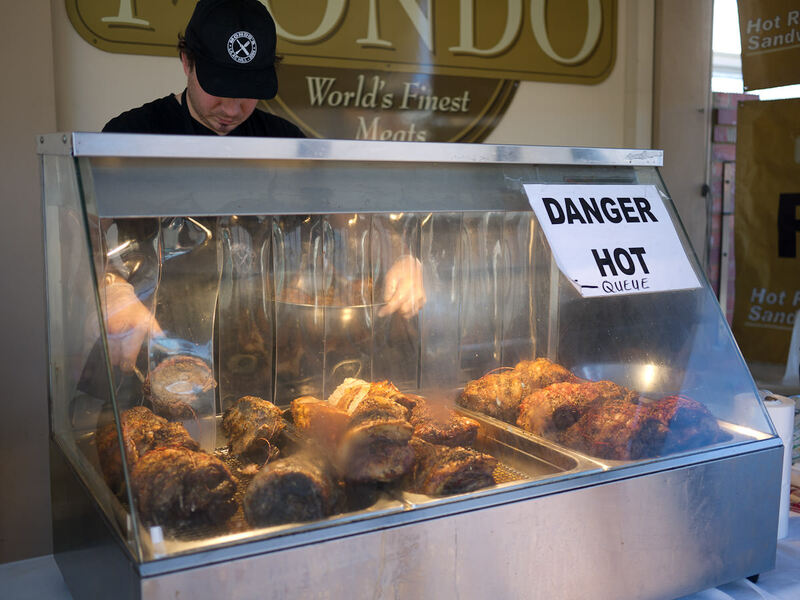 Mondo’s hot roast meat sandwiches were among my top 5 eats for 2010. Below is my video from last year of a Mondo roast pork sandwich made in 33 seconds. Like Mondo Markets on Facebook for latest updates. Look out for the #mondomarkets hashtag on Twitter. A lovely article on Vince Garreffa, the man behind Mondo, by Kell Rowe.